Challenging market conditions have hit Singapore-listed real estate investment trusts (S-Reits), say analysts. While S-Reits are still a favourite of investors here as they consistently outperform the Straits Times Index (STI), 27 Reits and six stapled trusts listed here reported an average distribution per unit (DPU) growth of 1.8 per cent in the first quarter, according to a press release by SGX yesterday. The list excludes recently listed Manulife Reit, Fortune Reit which reports earnings on a half-yearly basis, as well as Saizen Reit. This is the first time SGX has collaborated with the Reit Association of Singapore to track the quarterly performance of S-Reits. But similar data available from OCBC investment research showed that the average DPU of 22 Reits came in at -0.9 per cent on a year-on-year basis for the first quarter ended March 31, compared with positive year-on-year growth of 1.9 per cent for the quarter ended December last year. Analysts unanimously agreed that S-Reits performances had slowed. Mr Soong Tuck Yin, executive director and head of property research, Asia at Macquarie Securities, said that the results were "within our expectations of a slower growth environment". "S-Reits will be bracing themselves for slower growth, coupled with some margin pressures, particularly in the industrial sector. All sectors face their own challenges, but on a relative basis, we think suburban retail will do better, followed by office Reits." S-Reits will be bracing themselves for slower growth, coupled with some margin pressures, particularly in the industrial sector. All sectors face their own challenges, but on a relative basis, we think suburban retail will do better, followed by office Reits. According to the SGX release yesterday, iREIT Global, which owns German offices, posted strongest year-on-year DPU growth at 43.6 per cent, while OUE Commercial Reit reported year-on-year DPU growth of 33.3 per cent. 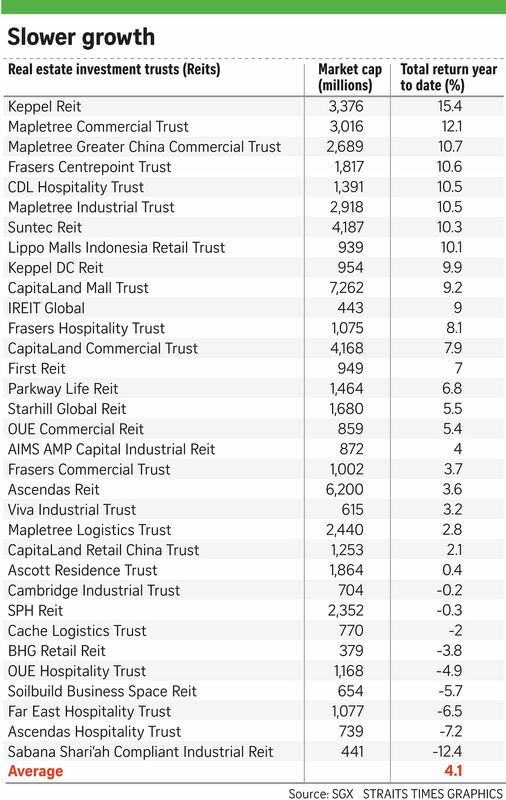 The S-Reits which posted the highest total returns in the year to date were office landlord Keppel Reit, which reported 15.4 per cent returns, while Mapletree Commercial Trust, which counts VivoCity and Merrill Lynch Harbourfront in its portfolio, and Mapletree Greater China Commercial Trust reported 12.1 per cent and 10.7 per cent respectively. RHB research investment analyst Ivan Looi said that despite slower performance, he would still consider Reits to be choice picks. "There are still some bright spots that investors can get exposed to, such as retail and hospitality Reits. We like the retail sub-sector for its unbeatable resilience. We are also encouraged by the Reit tenants' sales and shopper traffic growth in the latest quarter. For hospitality, tourist arrival numbers have been encouraging, increasing 13.8 per cent year on year for the first quarter of this year." But Mr Derek Tan, an analyst at DBS, cautioned that the outlook for S-Reits remains muted as most landlords are expected to "turn on the defensive, with a focus on maintaining occupancies and foregoing rental growth". "We expect Reits to continue pursuing an overseas expansion strategy to diversify (their) earnings base and to seek higher growth. Countries of interest include Australia, Japan and China, which are driven by lower interest rates."